I'm so glad I have a tummy! Moms night off! Skip the stove. "I'm so glad I have a tummy." I told Lily today. 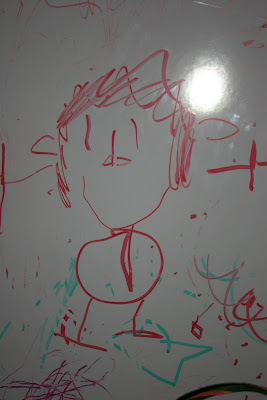 Lily made her first drawing of me with a body. When I look at the journals I kept as a little girl they are filled with bodyless faces. Octopus-like beings with arms and legs coming out of their heads. Lily too has countless papers like these....filled with all her loved ones. I knew from my journals that the day would come when she would cross over to the world of torsos thus beginning her changing view of reality. They say children go through stages. First there's the scribbling stage....pretty self explanatory. Then the preschematic stage. This is when their first conscious creation of form occurs around age three and provides a tangible record of the child's thinking process. The first representational attempt is a person, usually with circle for head and two vertical lines for legs. Later other forms develop....like the body! Later there's the schematic stage around age 7-9 in which everything now sits on a baseline and objects have spacial relationship. And then the realism stage in which legs overlap...the list goes on. I've found it's actually bittersweet. What will Lily's journals look like when she's 6? If she's like me they will be filled with pages upon pages of her likes. An entire book filled with 3 word sentences. "I like strawberries." "I like apples." "I like jumping." There weren't a lot of things I disliked at 6. What will her journals look like when she's 9? Will they have poems about the wind and growing old? What about when she's 14 and embarrassed to be seen with her mother? Will they be filled with angsty verses about her woeful childhood? It's all just blank pages waiting to be filled. But for now, I'm happy with my new tummy. Last Night Brian and I went to the theater and can you guess what happened? Well, if you've read my profile you know we went to see "Star Trek". And as the title came up on the screen I thought about how funny the name was.....star....trek....a trek to see the stars. It's not punchy, it's not intimidating, it's plesant and whimsical. I imagine if the franchise was created today it would be called something like STAR ARMY! Thank god for 60s camp! What people who didn't see the film don't know is that the writers have solved the fatal flaws of the story device known as "the prequel". That being: you know exactly what is going to happen and who is going to live and die. Their new concept coyly sets up an entire new franchise of young, attractive Star Trek movies. Why, they created an alternate reality of course! One in which all of planet Vulcan and its 9 billion inhabitants are engulfed by a black hole and OH YEAH, Kirk's father has died at the moment of his birth creating a more rebellious, at times misguided, Kirk. I like it. I like the new faces. (top photo, left to right: Chekov, Kirk, Scotty, Bones, Sulu, Uhura. Not pictured, Spock, who was also great!) I thought the Bones character was a little over the top. But I guess that was the point, right? There was definitely a 'Damn it Jim, I'm a doctor not a ......" moment in there somewhere. Overall, I really liked it. So much in fact that I forgot my cell phone in all my excitement and had to drive back in the middle of the night to retrieve it. Granted, it doesn't take much to divert my attention from what's happening around me but it's certainly not a bad sign! Do any of you like soft cheese? I find soft cheese lovers are quite few and far between. 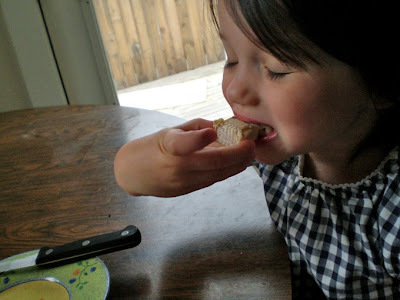 In a desperate attempt to share my love of cheese I've turned my four-year old daughter into one. A soft cheese lover, that is. She lovingly refers to it as 'stinky cheese' and hides it from grandma (also a soft cheese lover) whenever I bring it home. She and I both LOVE LOVE LOVE this special cheese that you can't find anywhere but in this tiny German shop down the street from our house. It's called cambozola and if you love soft cheese....go forth and FIND IT! Like now. 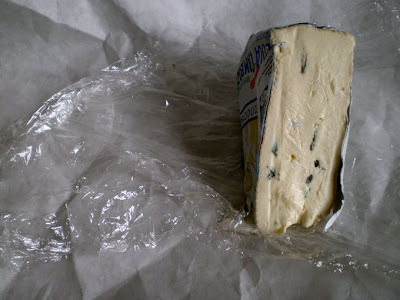 It's actually a combination of a French soft-ripened triple cream cheese and Italian Gorgonzola. But I like to say it's something between brie and blue cheese and tastes best when its been sitting in your fridge for a week or so. Please, give cheese a chance! Oh, I'm sorry, I had to end on a pun. I don't know if any of you have heard about this or perhaps I'm the last to know but yesterday a friend of mine stopped by for a fabric run. On our way back she mentioned that her mother had told her about this coupon on the Oprah Winfrey show for a free KFC meal. No strings attached. Rather skeptical, we returned home, I visited the site and sure enough there it was: a coupon for a free two piece meal with two sides and one biscuit. We printed out three coupons and went down the street to our nearby KFC. If you want to collect your free KFC meal go here. One caveat....we redeemed our coupon yesterday. From what I heard, some people are now having a hard time printing/redeeming their coupons. I guess there's been a 'coupon riot' of sorts. It's one per person and each person must be present to collect. We finally took out all the summer stuff and scattered it all over the lawn. 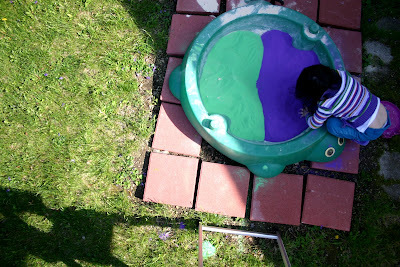 This year I bought green and purple colored sand. Pretty cool! Who knows how long it will look this good? It covers this ugly barren dirt patch in our yard where a huge strange plant used to reside. Lily and Molly played in it while Brian cut the grass. When I finally had to bring them inside Molly literally screamed with disappointment. Oh and check out my new ladder:) You can see its silhouette. No more stacked telephone books on dining room chairs! I'm finally moving up in the world! LITERALLY.